1. Go to a bar and have someone pour you a cold wheat beer. Drink it while beads of moisture collect on the glass, cooling the palms of your hand each time you take a sip. Sit in the window of the bar so you can see your fellow citizens pass by (incidentally, where do they find such cute sandals?). As you finish your beer, the knot of tension in your upper back will slowly disintegrate and you'll walk home in a pleasant fog. 2. At home, find yourself the four smallest, firmest, freshest zucchini you can get your hands on. If you must pick them from a garden patch yourself, do so. Slice them lengthwise with a mandoline, if you've got the nerve, or a very sharp knife (I haven't used a mandoline since the Great Thumb-Slicing Incident of 1993, which I think still has my father traumatized, so let's hope this offhand mention doesn't incur some kind of PTSD in him. Stay cool, Pops.). Lengthwise, I said, not crosswise, like I did. Maybe you should wait a little before finishing your beer and then reading the recipe instructions. Definitely wait before using the mandoline. 3. Dress the paper-thin zucchini slices with a lemon juice dressing and collapse on the couch, which is conveniently situated across from the air conditioner. Wait there until the beads of sweat on your brow and back and arms dry. Kill a millipede for the third time this week and thank your lucky stars to be vacating the apartment in a month. Open the door to the back patio and realize you only have a month to enjoy it. Find yourself torn between hatred for millipedes and love for your patio. Realize the Raid fumes might be getting to your head. Feel a twinge of embarrassment for killing a millipede with roach poison. Try to stop thinking about bugs altogether as they are killing your buzz and ruining your already miniscule appetite. 4. Go back to the couch and sit there in the stream of cold air until goose bumps start to appear on your skin. During this time, you may a. read The New Yorker, b. watch an episode of Big Love, or c. try to imagine just exactly where you'd put the couch and hang the paintings in a two-bedroom dream apartment. Choice c. somehow ends up being the most entertaining. 5. When you have tired of your virtual interior decorator, peel and thinly slice an avocado. 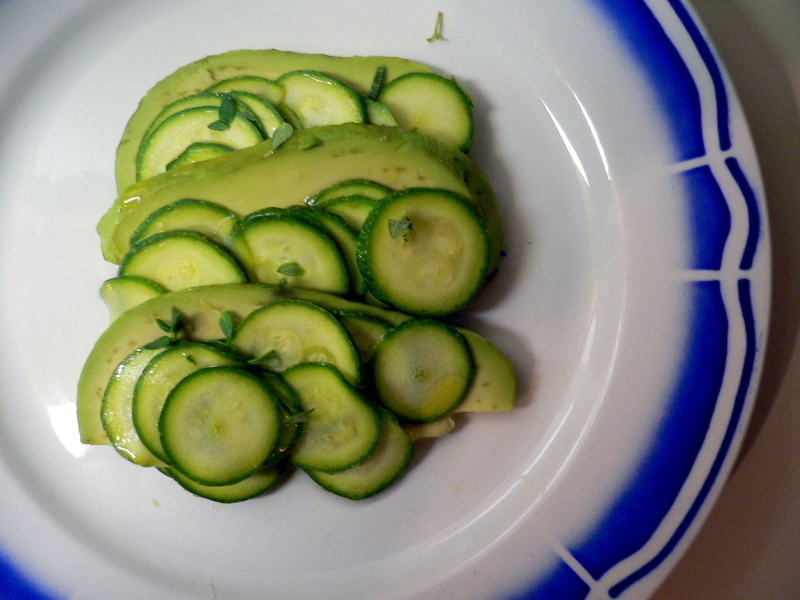 Attempt to layer avocado slices along with the marinated zucchini slices on a plate. Artistically, if you may. Drizzle the dressing over the vegetables, then pluck little leaves of thyme off the stalk and drop them around the plate. Realize you don't have any pistachios. Briefly contemplate using salted peanuts. Decide against it. Beer hasn't incapacitated you that much. Sufficiently chilled from your wind-powered air conditioner, go out on the patio and eat your salad. 6. Realize happily that raw zucchini are quite delicious, in a subtle, grassy way. With the faint crunch of sliced zucchini against the creamy avocado, punctuated by the herbal thyme, the salad is cooling and delicate and lovely. Think about when you lived down the street from Patricia Wells in Paris and how you used to dream about doing her dinner party dishes in return for cooking classes in Provence. Remember all the one-plate meals you ate in your little studio there, and how lonely you were, which makes you realize just how un-lonely you currently feel. Finish your delicate little dinner and sit in the heat for a few minutes longer. The air-conditioner can wait. 1. Stir together lemon juice and 1/2 teaspoon salt in small jar. Add oil, cover and shake to blend. 2. Slice zucchini lengthwise as thinly as possible, using mandoline or very sharp knife. Spread slices on platter and drizzle with lemon mixture. Tilt platter to evenly coat slices. Cover with plastic wrap and marinate at room temperature for 30 minutes to an hour. 3. Alternate zucchini and avocado slices on individual salad plates, slightly overlapping each slice. Sprinkle with pistachio nuts. Season with salt to taste, garnish with lemon thyme, and serve.